Abbeystead is a small village in the Forest of Bowland. The main photographic interest is Abbeystead weir, an impressive horseshoe shaped weir on the River Wyre built in the 19th century to supply power to mills further down the river. Today the weir serves no useful purpose, but remains an impressive sight. The weir is reached by a short walk from Abbeystead village. Unfortunately this quiet village hit the headlines in 1984 due to a disastrous explosion at a pumping station which was being visited by residents of nearby St Michaels on Wyre. Of the 44 visitors, 16 were killed and many of the others seriously injured or burned due to a methane explosion in the pumping station. Today the village is very quiet and peaceful, with no hint of those catastrophic events other than a commemorative plaque. Parking is available at Stoops Bridge car park. If arriving from the M6, drive through the village, over Stoops Bridge on the Tarnbrook Wyre and turn immediately right into the car park. From the car park, follow the lane alongside the river until a small tributary is crossed. Just past this tributary, turn right through a gate and follow the path. After a few minutes, a pleasant spot is reached where a small stream cascades down the hillside to the left of the path. The path stays fairly close to the River Wyre but with no notable views until the Abbeystead Reservoir is reached. 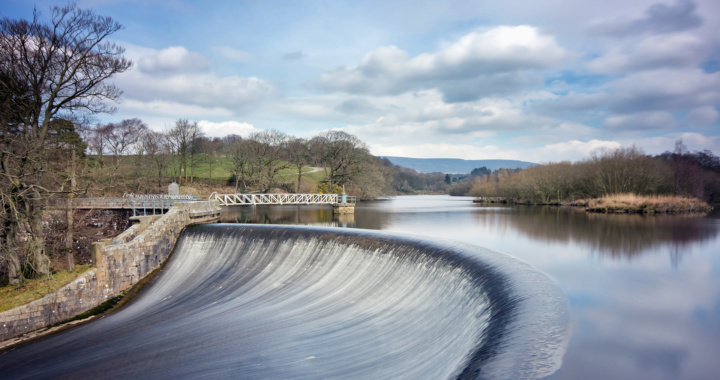 At the far end of the reservoir is a graceful curving weir, where the overflowing water streams down a narrowing chute before ending with a waterfall into the river below. The path then descends beside the weir, until a footbridge over the River Wyre is reached. On the far side of the river, there are views of the weir and waterfall, however the best view is obtained from the river’s edge. There is a salmon ladder, and with a bit of scrambling through the undergrowth, it is possible to descend next to this and get down to the rocks by the river’s edge. It must be stressed however that this can be dangerous, so care is required. The exit from the weir area is to return to the footbridge, and climb over the adjacent wall using stone steps set into the wall. On the far side, there is a wide track which heads to some farm buildings, however just before the buildings, there is a right of way across the field to the right which leads to a gap in the wall back onto the Abbeystead road. Descend the road into Abbeystead village, and continue on over Stoops Bridge to return to the car park. To avoid the muddy outward walk, the reservoir can be reached by following the return route described above. From the car park, walk through Abbeystead village, follow the road up the hill and look out for a signposted footpath through a gap in the wall on the left side of the road. Posted in Lancashire and tagged Riverside, Waterfall.